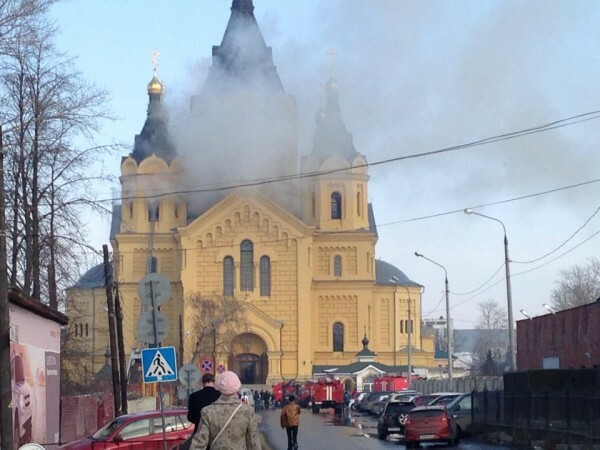 Nizhny Novgorod, March 12, Interfax - The fire in the bell tower of the St. Alexander Nevsky Cathedral in Nizhny Novgorod has been extinguished, the regional branch of the Russian Emergency Situations Ministry said in a press release. “The open fire was extinguished at 12:31 p.m. No one was killed or injured,” it said. The city’s emergency services were alerted about the fire at 11:42 a.m. Moscow time. The first firefighters who arrived at the site observed plumes of smoke billowing from the third floor of the building. The blaze started in the cathedral’s bell tower, which is a semi-detached building. It was contained at 12:12 p.m. The bell tower’s floor and walls in an area of 30 square meters were damaged. The cause of the fire is being established.